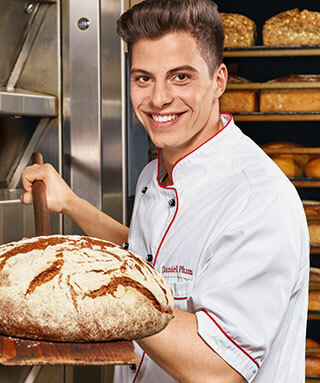 As a supplier of baking raw materials, EIWO Wolfram GmbH is a medium-sized family business based in Coesfeld. EIWO's core competencies include the distribution of fresh and dry products as well as non-food articles, with strong and reliable in-house logistics providing considerable support. The products are continuously tested in our in-house laboratory and the working methods at EIWO are in accordance with ISO 9001 and IFS Logistics Food Standard. Our satisfied customers place the highest value on product quality at minimum prices and absolute delivery reliability. Thanks to our optimal nationwide networking, this is possible "just in time". We successfully supply our customers in Germany and the Netherlands on short and direct routes - i.e. without ineffective field service. With our innovative marketing strategies, we see ourselves not only as a supplier of inexpensive quality products, but also as reliable and conceptual support to guarantee success with our customers' end consumers. The satisfaction of our customers is our top priority. We have proven it and prove it every day anew. Our comprehensive know-how, 27 years of experience, quality and innovation are the basic elements of our extraordinary success and therefore for you, a stable and reliable business partner! Our prices and our strategy are calculated so effectively that you benefit noticeably. We are different and we are successfully changing the market to your advantage.